We here at Neon talk a lot about donor-centric appeals, and with good reason – they drive results. Especially at the end of the year, when most people’s inboxes are filling up with holiday sale reminders and requests from other organizations. By this point, you probably already have some of your early year-end planning done. If not, check out our newest e-book, “The Ultimate Guide: Year-End Fundraising”. That will get you up to speed on everything you need to prepare for the year-end giving season. If you’re all caught up, keep reading. We know you want your appeal to stand above the rest, and we want to help you accomplish that. That’s why we’re going to break down exactly what it means to craft a donor-centric appeal. Before you begin to craft your ask, it’s important to consider how you want to frame it. Even though personalization is important, you can still use the same core story across your separate audience. As a nonprofit professional, you probably have quite a few compelling stories about your staff, your operations, and your constituents. It’s tempting to include as many as possible in your year-end appeals, but in this situation, quality trumps quantity. Focus your efforts on telling one gripping story that illustrates your organization in a human way. It could be about the success of a former program participant, the impact a recent event or achievement had, or a testimonial from a constituent. Really, any story works as it highlights how effective and valuable your organization is. Donors want to feel like they’re a helping hand in making dreams come true. Keep your appeal positive and appreciative, and avoid language that might make your donor feel like they need to solve your problems. In most cases, donors are less likely to contribute to an organization that is perceived to be financially stressed. Instead, keep the narrative on your organization’s success stories, and let donors know how important they were to the achievement. After all, your donors are part of the reason your organization is able to do the important work it does. Use your appeal as a chance to give those heroes some recognition. These are your constituents who, respectively, have donated Last Year But Unfortunately Not This Year and Some Year But Unfortunately Not This Year. These two lists will bring up all your lapsed or at risk donors. Most CRMs – including Neon – have these reports built into their systems. If yours doesn’t, you can build your report out using the criteria below. When crafting an appeal for these two audiences, your main goal should be to remind them about their past support. It’s not uncommon for donors when and how much they gave. Use your CRM data to plug in those bits of information, along with a personalized “We’ve Missed You!” statement. Your message to LYBUNTs can also include more concrete information on what their donation helped accomplish in the past year. Express your appreciation for their support, and follow that with information on what their next donation can possibly achieve. There are countless potential donors out there that want to support your mission but have no idea what donation amount to give. That’s why it’s important to provide suggested giving levels. Use your CRM to sort your constituents by previous donation amounts. Your top donors should receive hand-written, personalized letters. The rest of the groups can receive appeals with designated giving levels, based on their total donation averages. But always be sure to leave a blank option for donors who would prefer to give a different amount. That way, you avoid alienating donors who want to give, but can’t afford your suggested giving levels. Once your giving levels have been established, consider branding them with names relevant to your mission for a truly donor-centric experience. You can use this as an opportunity to recognize donors giving level titles, or with the inclusion to a giving level society. If certain giving levels create tangible results, include that information, too. People will be much more incentivized to give if they know that a $20 dollar donation could buy a weeks worth of school lunches for a child in need, for example. Your top donors should receive appeals that are as personalized as possible. You may want to consider creating individual appeals or taking an alternate approach like phone calls or in-person asks. Now you’re ready to craft donor-centric appeals that inform and inspire! All you need is a clear and convincing call-to-action, and you’ll be ready to go. Make sure your audience feels a sense of urgency, and don’t forget to take advantage of the P.S. to hammer it home. Ready for the next step? 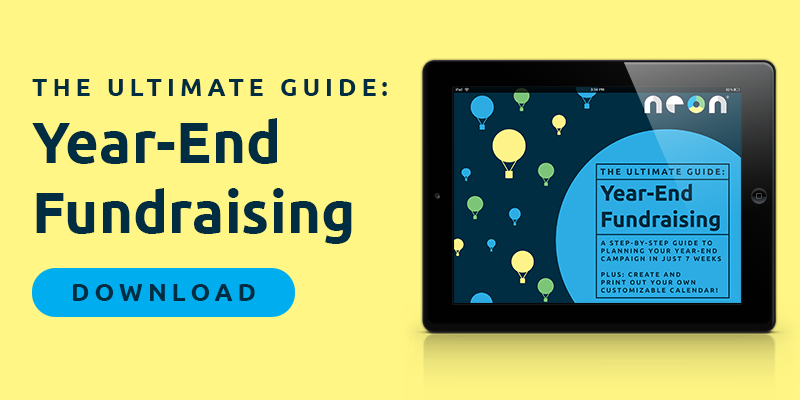 Download our newest e-book, “The Ultimate Guide: Year-End Fundraising”. Inside, you’ll find our best practices for following up on appeals, crafting the perfect thank you messages and promoting your cause to new donors. The secret to your best year-end campaign yet is right here.